A few days ago (August 23rd), Angela from Around Valbonne Daily Photo posted a picture of a camouflage scooter she found in her city. 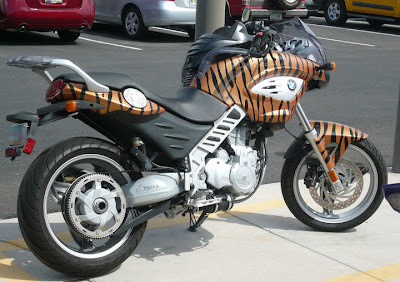 Well, today I found a Tony the Tiger motorcycle! Imagine zooming around the city on this sleek cat-like machine. I bet it purrs very nicely! 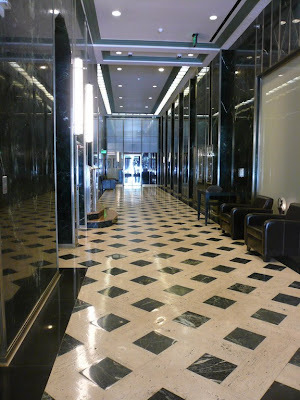 This is the beautiful art deco lobby of the Orpheum Lofts building that I featured yesterday. 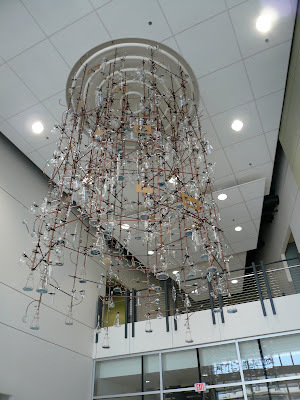 When I worked in this building, this was my favorite feature of the building. Maybe someday I can get inside and photograph the fabulous etched steel elevator doors. I have always been a fan of art deco and I always thought this lobby was one of the best examples I’ve found in Phoenix. 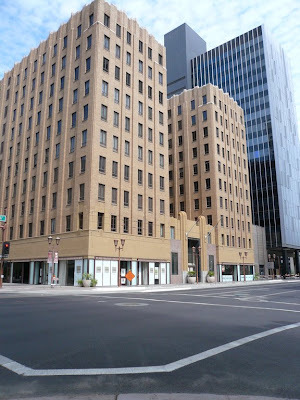 This is a historic building in downtown Phoenix that was an office building until just recently. It has now been converted to condominiums. It holds fond memories for me because I actually worked in this building a few years ago. One of these days I’m going to ask to see one of the condos. Maybe I can find the one that encompasses the office where I once worked. You never know, maybe someone’s brand new kitchen once encompassed my humble work cube. 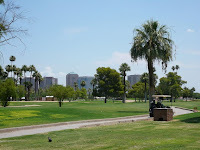 Encanto Golf Course, adjacent to Encanto Park provides a beautiful setting for a morning on the greens. 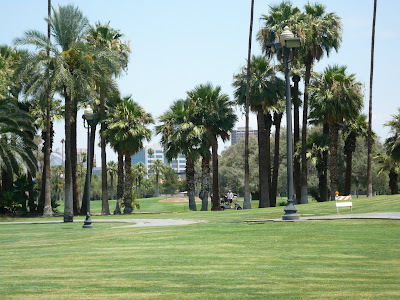 How many golf courses provide lovely greens surrounded by tall palm trees and even taller high rise buildings? Green fees are approximately $50.00 and the course is par 70 with a rating of 69 and slope 111. I’ll be honest; I’m not a golfer so I have no idea what that means. If you think you might want to give it a try one of these days, you can get more information here. 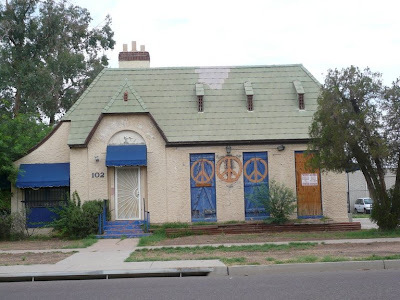 This historic home has belonged to the City of Phoenix Parks and Recreation department since 1935. If you call the city to reserve a park area, you are most likely talking to someone working in this historic setting. The house was built in 1912 by Dr, James C Norton for his wife and four children. 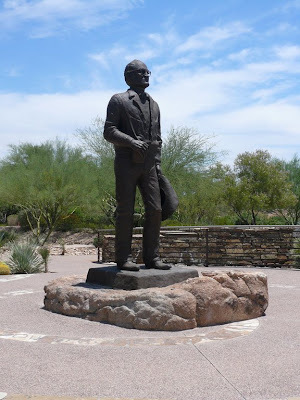 Norton moved to the Arizona Territory in 1892 from Ames Iowa. He opened a veterinary medicine practice and later did some cattle ranching on the property surrounding this home. The property was purchased by the city along with some other property to create Encanto Park, a 200 acre park in central Phoenix. While some old office buildings are being given new lives, others have reached their end. 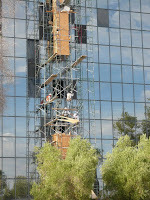 This building started its life as the home of Mountain Bell which became Qwest Communications. Qwest moved to a new location some years ago and in 2004 the building was purchased by a California developer who planned to convert it to luxury condominiums. Rumor has it that the asbestos clean-up proved to be overwhelming so the decision has been made to tear it down. The land covers 8 acres so the plan now is to build a high-end senior community on this spot. An interesting thing about this building is that it was designed by Phoenix architect Al Beadle. The same man who designed the Executive Towers that I featured on August 15th. 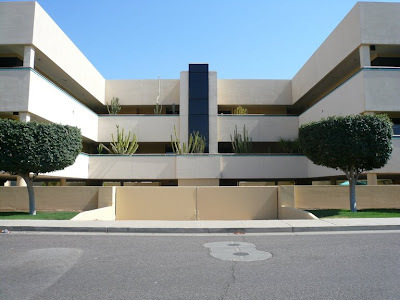 There are some other Beadle designed properties in Phoenix that I’ll show you in the future. 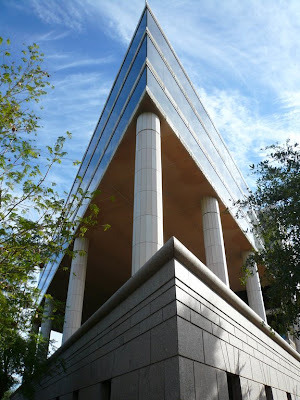 This building was originally a high-rise office building built in 1974. 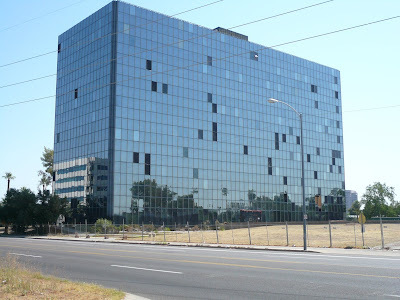 It was basically a big square black glass building with no outstanding features. It is going through a huge metamorphosis right now and being converted to condominiums. Because it sits closer to Central Avenue than any other high-rise along the street, it will offer residents some spectacular views of the Central Corridor and beyond. 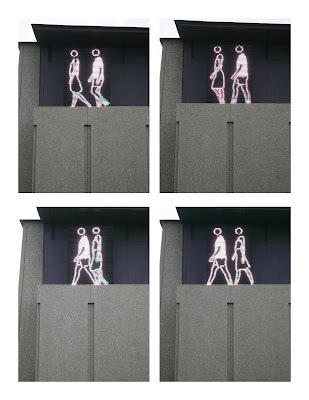 On back side of the Phoenix Art Museum is a programmable LED display of two people walking. 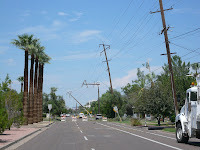 It can be seen from McDowell Road, a major thoroughfare in Phoenix. It appears to run all of the time with these two electronic caricatures casually walking along. I took these four pictures and put them together to give you an idea of how it looks. The woman is ahead and then the man overtakes her and soon she overtakes the man again. And so it goes, on and on. For some reason, I find it very amusing. The Phoenix Art Museum’s roots go back as far as 1912 when the Phoenix Women’s Club and the Arizona State Fair committee decided to start a fine arts program. The first permanent location was set up in 1936. The museum moved to its current location on Central Avenue in 1959. In 2006, the museum went through a major expansion that more than doubled its size. The collection spans the centuries with works from around the globe. It’s one of my favorite places in Phoenix to spend a quiet afternoon. 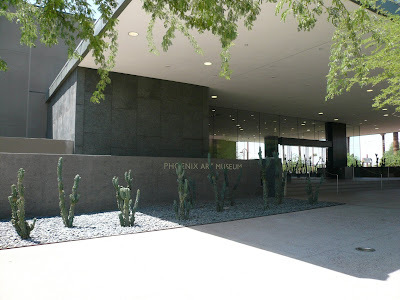 The Phoenix Art Museum is another Phoenix Point of Pride. This photo is of the new entrance to the museum. 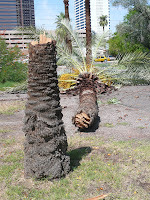 I am fortunate to live close to two amazing museums, The Phoenix Art Museum and the internationally known Heard Museum. One of my favorite pastimes is to spend some leisure time exploring one of these places and treating myself to lunch at their wonderful cafes operated by Arcadia Farms. That is exactly what I did this weekend. I took this picture while I was waiting for my salad to arrive. What a great way to spend a Saturday. 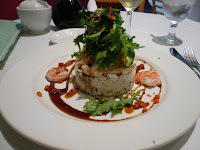 By the way, that salad is called a California Roll salad and it was excellent. 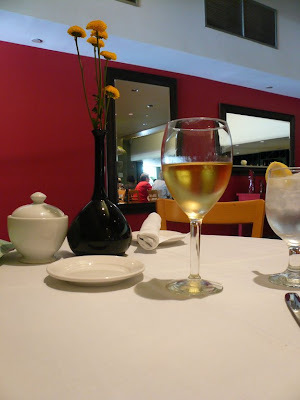 Because I work from my home at least two days a week, I can even slip out to one of these great lunch places and treat myself during the week. I discovered this blooming cactus in my backyard today. 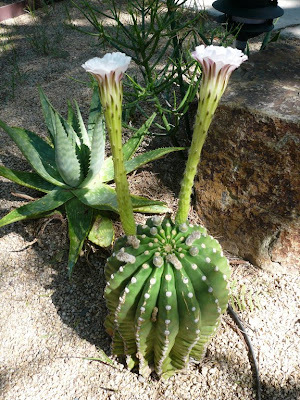 I have never seen this cactus bloom before so I was excited when I saw the long stems yesterday. Today I had two beautiful white flowers. There appears to be more buds so maybe I’ll get more blooms as the days pass. 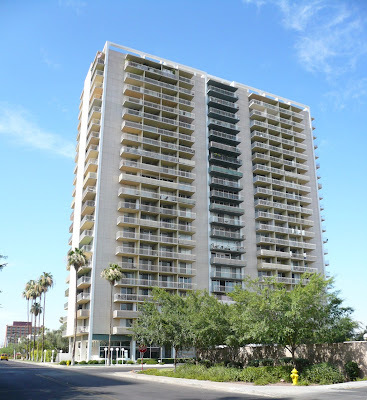 Executive Tower was the tallest building in Phoenix at the time of its construction between 1962 and 1963. It began its life as an apartment building, but has since converted to condominiums. It was designed by a young architect, Al Beadle who had no formal training. Beadle was a former Navy SeaBee and was only 33 years old at the time he created this design. If you look closely you can see some light fixtures that line the sidewalk around the front and sides of the building. This round type of light fixture was a favorite of the architect and they became affectionately known as “Beadle Balls”. When I first moved to Arizona, I dreamed of living here one day. Coming from a small mid-west town, this was the epitome of sophisticated big-city living to me. Much later, I would get my chance at high-rise living while working special assignments in St. Louis and Chicago. The experience was everything I hoped it would be and much more. 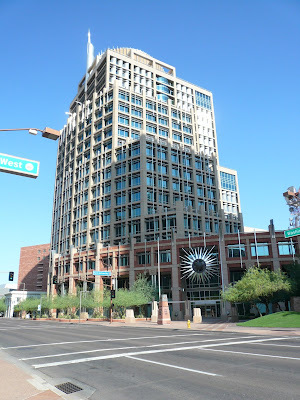 The Arizona State Courts Building is unique in design and in construction. I took this photo from one end because of the striking image it makes. The building has a traditional appearance on the front complete with dramatic stairs and columns. From the back it looks like a modern office building that comes to this knife-like edge in this corner. The entire exterior of the building, including the roof, is rubberized except for the windows of course. If a puncture occurs in the roof, Goodyear sends out a team of people to reseal the rubber. I had to chuckle when I spotted this building. Does every big city have and Acme Building tucked away somewhere? 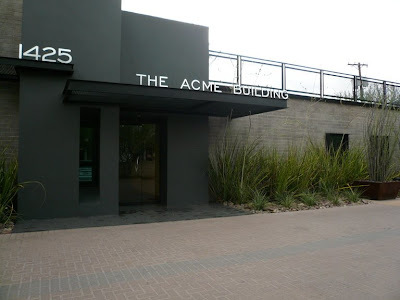 The names Acme Building or Acme Corporation have been used for years in films, cartoons, and even television programs. When I saw this one, I couldn’t help think of Guy Noir, Private Eye. However, as you can see, Guy would have difficulty getting to the 12th floor of this building. For those of you who don’t know the infamous Guy Noir, he is a fictional character regularly featured on Garrison Keillor’s “A Prairie Home Companion” radio show on public radio. Guy Noir works on the “twelfth floor of the Acme Building in a city that knows how to keep its secrets”. 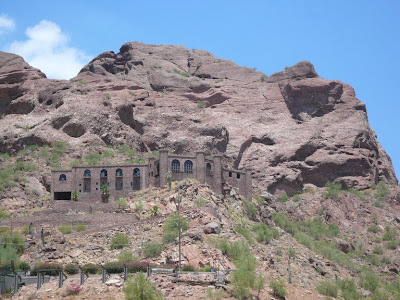 When I spotted yesterday’s house I immediately thought of this well known Phoenix residence built into the side of Camelback Mountain. 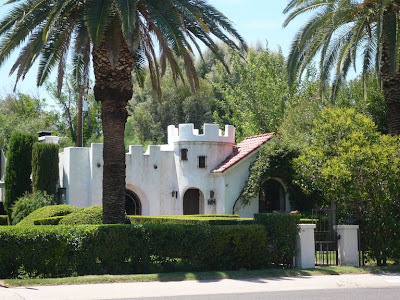 This house is known as the Copenhaver Castle named for the Phoenix orthodontist who built the place over a twelve-year period during the 70’s and into the 80’s. The exterior walls were built of stone blasted from the mountainside property which makes it blend into the mountain’s terrain and almost disappear in certain light. 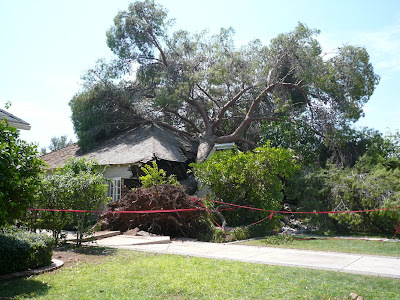 The house has been featured on the television show “This Old House” and other television shows. At one time, Dr. Copenhaver opened the home to tours on special occasions, but after the home sold in 1989, it is now a strictly private residence. The home was built in the style of a Moorish castle complete with battlements and rounded towers. I spotted this modest little house when I was running an errand and took a side street to avoid some heavy traffic. 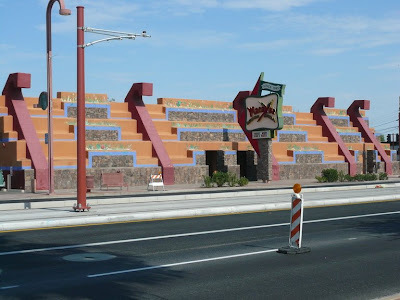 It was located on the corner of a mid-Phoenix neighborhood. It certainly looks as though someone has attained a bit of royal atmosphere for their humble abode. Check back tomorrow and I'll show you another Phoenix castle. 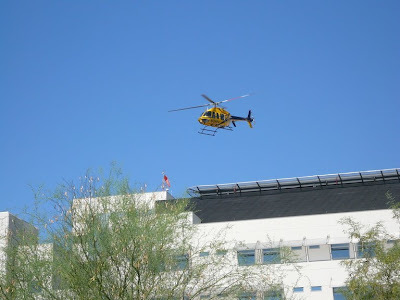 I live close to one of the major hospitals in Phoenix, St. Joseph’s Hospital & Medical Center. From time to time, I can hear the emergency helicopters landing on the roof of one of the hospital buildings. When I heard one land this morning, I decided to drive closer to the hospital to see if I could catch it when it took off again. I didn’t have to wait long before the engines restarted and it flew away on another mission of mercy. The Shemer Art Center is another Phoenix “Point of Pride” location. 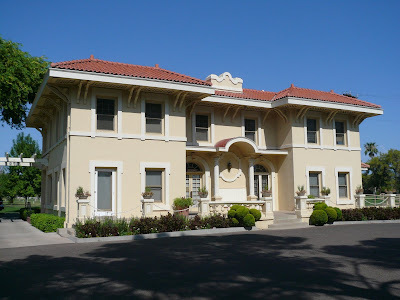 The property, including a historic home was donated to the city by Martha Eward Shemer in 1984 with a dream to preserve the property and provide a community arts education facility. The art center was born that same year. The house is now an art gallery with space for art classes as well as special exhibitions. The grounds serve as a sculpture garden where this sculpture by Joe Tyler can be found. 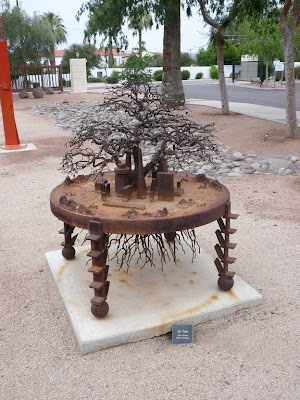 The title of this piece is “Urban Forestry” and it quickly became one of the favorite pieces in the garden. Tyler had a 20-year career in horticulture before deciding his welding skills could bring his love of plants and landscape to life through art. 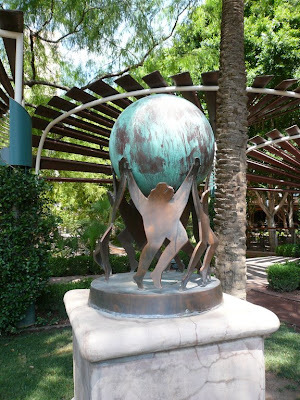 This small sculpture is located in the gardens of the Arizona Center. It’s titled “In our Hands” and it is dedicated to the Sisters of Mercy who started the first hospital in the Arizona Territory before we became a state. It made me think that the world is truly in all of our hands and we had better start taking better care of it. 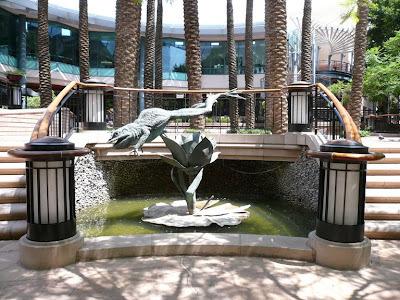 This is one of the many fountains located on the grounds of the Arizona Center. There are a series of three fountains like this with sculptures of frogs in various poses. These fountains face a well-landscaped garden that is shaded by large trees. If you dine at one of the two main restaurants, you can sit on the patio and face the garden. 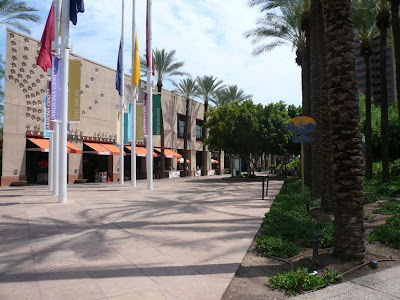 The Arizona Center is a shopping and office complex located in downtown Phoenix. It was opened in 1990 as a key component in downtown revitalization efforts. Because of a lack of permanent upscale housing in the downtown area, the retailers struggled and the center evolved from all retail to part retail and part offices. That issue is gradually changing. 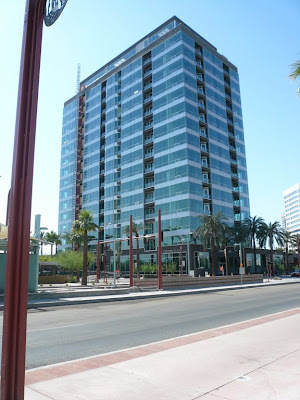 Arizona State University has opened a “downtown” campus and condominiums and apartments are cropping up everywhere. The center contains a number of restaurants, a major theatre multiplex, and specialty and gift shops. 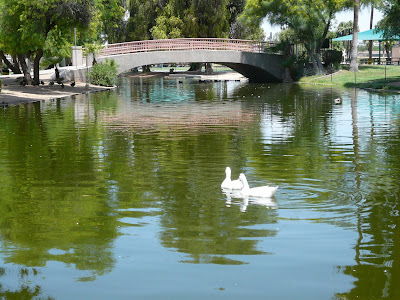 It is also home to another desert oasis, with beautiful fountains and gardens. The Arizona Center is another Phoenix Point of Pride. If you look closely, you can see the sign to the right of the walkway in this picture. I thought I should post a picture of the museum that houses the statue featured yesterday. 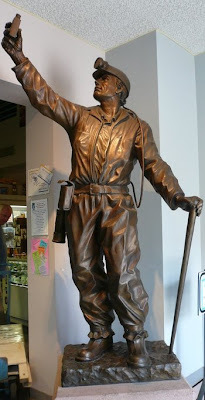 This museum commemorates the mining industry. Arizona is the nation’s number one mining state with the largest value of non-fuel mineral production in the country. The collection of minerals in this museum is said to be one of the finest in the world. Early in Arizona’s history, the state’s economy relied on the five “C’s”, Copper, Cotton, Cattle, Citrus, and Climate. This museum highlights the importance of copper as well as other mining. If you think the building looks a little exotic to have always been a mineral museum, you would be right. 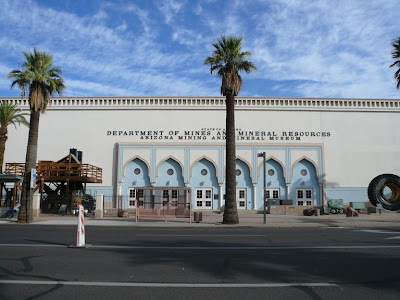 The museum is housed in a historic building that was once the El Zaribah Shrine Auditorium.